Here is another painting by Russian portrait painter Ivan Kramskoy with a similar contemplative stare as the previous two posts. I seem to be drawn to this one more than the other two. Maybe it is as simple as the background or the details in his clothes. 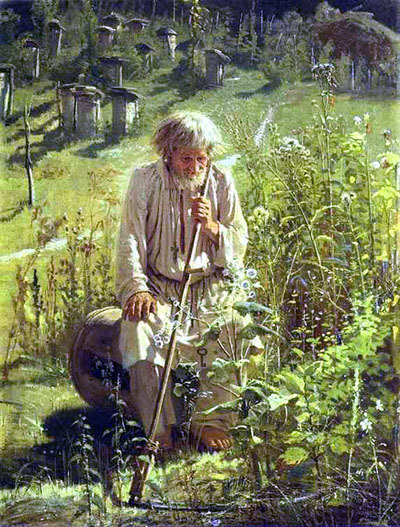 Or it could be that the bee keeper’s contemplation seems to come from a deep sense of joy or awe, whereas the woodsman I have no clue where he is at (a fitting description for Smerdyakov in B.K. ), and Christ’s contemplation is connected to the stress of the three temptations. More of Kramskoy’s work can be seen at Olga’s Gallery.